Were always watching Park City real estate market trends to see not just locations of where buyers are buying and sellers are selling  but at what prices. The following graphs reflect the sales results between 2015-17. Read through to learn what drove certain activities and note where anomalies occurred. This info may be helpful if youre considering buying or selling a home so you can see how competitive or active the market will be for your targeted price range. Between 2015 and 2017, the Park City market had a yearly decline in the number of single-family homes sold in the <$750k range primarily because home prices went up! As a result, all the selling activity shifted up to the homes priced between $750k-$1m  making that the most active price point range, with the highest number of homes sold in 2017 at 125 units. Following that same increase trend were single-family homes priced between $1.0m-$1.5m with 108 units, $1.5m-$2m with 78 units, and $2m-$2.5m with 46 units sold. The number of homes sold at the $4m-$5m ranges declined slightly, but then numbers increased in the $5m-$7.5m range with 27units sold. Much of this shifting in each of these price points was again the result of trading up to newer properties. 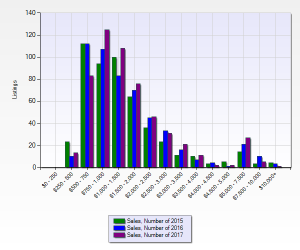 Of the homes sold in the $5m and above range, approximately 60% were ski in/ski out homes. 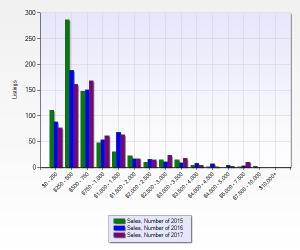 Its clear that 2015 was a big year in the <$500k price ranges, with 287 closed sales. The launch of Newpark Terrace in Kimball Junction was a big driver of this activity. We have yet to see that kind of volume since new building has been limited to smaller projects and has moved outside of Park City proper. The $500k-$750k range had its best year in 2017 with 168 units sold, reflecting the increase in condo prices. There was a mix of subdivisions in this range, which shows that sellers may have been trading up mixed with new buyers in the area. Although the numbers are small for higher price point condos, 2017 had its highest number of units sold in the $2.5m-$3.5m ranges with 23 units and 18 units sold respectively, and in the $5m-$7.5m range with 10 units sold. 2018 promises to see several newly built projects within the Snyderville area with Apex and Viridian rolling out by late Spring. These will have higher price points starting in the high-700s. How can this info best work for you? Whether youre considering buying or selling, talk to one of our You In Park City real estate professionals to find out. *Within Park City and Snyderville Basin city limits. Posted in Uncategorized | 0 Responses to "Park City Real Estate: Sales By Price"